This workshop was presented by Professor Gunilla Widén(@gunillawiden) to members of Edinburgh Napier University’s Centre for Social Informatics. This post is based on my live-tweets and the text of Gunilla’s slides, so the good things here are from Gunilla, and any mistakes are by me. My thoughts are in block quotes. Just about all of these speak to me, although I’m not a fan of culture. (I see it as being mostly only that which the powers-that-be permit.) My biggest interest of these is possibly literacy for democracy. Gunilla reminded us of the traditional, linear view of IL (Figure 1). I would have thought that ethical aspects must be considered and implemented all through! investigating IL and generational differences. Digital literacy has a positive effect on the intention to use (both digital immigrants and digital natives). For digital natives, information literacy has no effect on intention to use, but it has a strong effect for digital immigrants. Moreover, the relationship between attitude to intention to use is not significant for digital immigrants, but it is significant for the digital natives. NB there is discussion about the meaningfulness and usefulness of the terms digital native and digital immigrants. See, for example, Inside Higher Ed and Kirschner & De Bruyckere (2017). Personally, I think that there is are spectra of digital involvement: from people who ‘live’ digital, to people who ‘do’ digital (I’m one of them), to people who use some digital techniques (my sister can scan and email documents, and look for some information online, but cannot navigate complex information) and people who just don’t do digital at all. Closer to Gunilla’s work, our Information Literacy for Democratic Engagement projects have shown that community councilors work with information almost entirely collectively, and that the important point is not just to present information but to use it to achieve concrete changes to policy. What skills and competence workers must have to continuously sense the information embedded in an always-evolving work artefact. Some of this may be of interest to Hugo Watanuki. How does information literacy (information sharing, readiness to learn, numeracy, computer self-efficacy) and workplace factors (flexibility, control) influence wellbeing at the workplace? Do types of work influence how information literacy and workplace factors influence wellbeing at the workplace? Do generational differences influence how information literacy and workplace factors influence wellbeing at the workplace? We can follow how much we use the Internet. 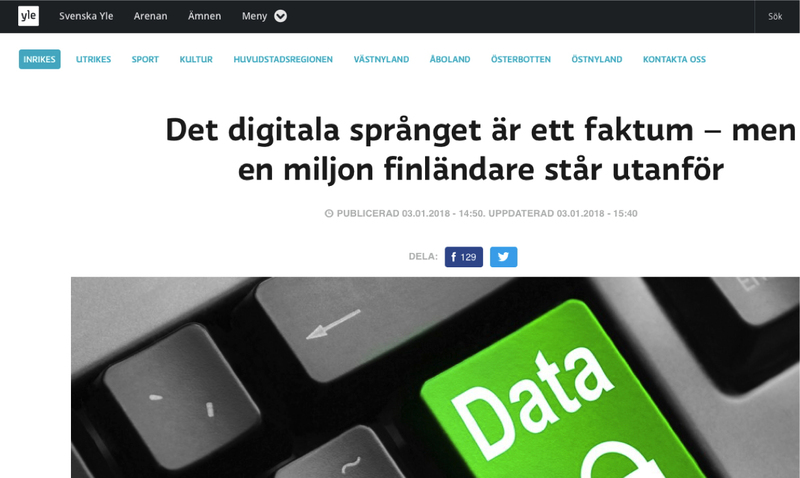 89% of the Finnish population use internet (82% daily, 76% several times a day). This is mainly for accessing digital services, communication, news and media, social media, purchasing services and goods. 70% use a data security service on the mobile phone. 3% has lost information or contact details because of viruses. 66% have actively limited access to their personal data etc. However, we know less about how we evaluate and use the information we access. We also need to focus those who are NOT active in the digital world. Evaluation and use of information in local democracy was the subject of the LILDEM and MILDEM projects by Peter Cruickshank and me. Unfortunately, we haven’t managed to crack measurement of IL, and the relationships between IL and competence in local democracy YET. A paper on MILDEM results is in progress. Gunilla and colleagues have some interesting results on information reliability and evaluation (Figure 2). This data covers users and non-users of Youth Information Centres. Gunilla said that we need to know more about information avoidance. This is a rarely studied information behaviour strategy and little is known about information avoidance in relation to what factors moderate information avoidance. In this survey around 25% of the respondents stated that they avoid information that they perceive to cause them anxiety or discomfort. Age and the gender of the respondents did not have any major influence on information avoidance. Correlation was observed between education, information literacy, and information avoidance. This means that information avoidance can be considered as an expression of one’s information literacy and conscious information management strategy. The youth may, for example, avoid information that would cause unnecessary negative emotionality, such as avoiding news they know would upset them. Information avoidance is a rational information strategy in the context of information overload. This strongly reminds me of some of my information avoidance. I have an incurable condition but could learn much more about controlling it. However, I just don’t want to, probably because knowledge will not lead to a cure. I don’t want to know from day to day how bad my condition is, because then I’d know how non-compliant I am. I am not a borg! Gunilla went on to cover the Future Foresight project. 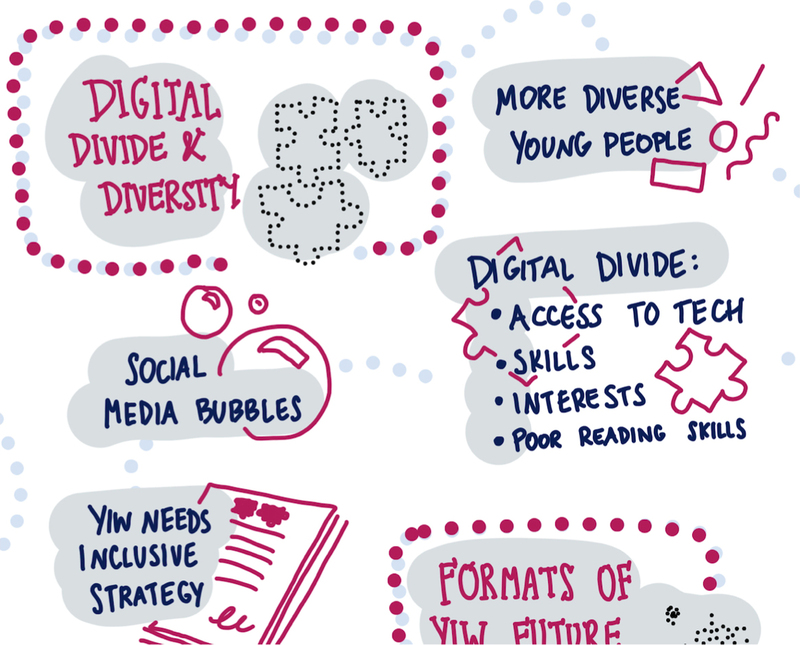 She also noted that ‘Challenges with digital divide and diversity was much emphasized by all three groups that were involved in the foresight pilots (youth, youth information workers and youth experts)’. Some of the challenges are shown in Figure 3 and Figure 4. What kinds of alternative futures are there? How can we predict consequences of different futures? What are the ways to reach the future we want? Information mastering strategies of young people is a complex and diverse matter. 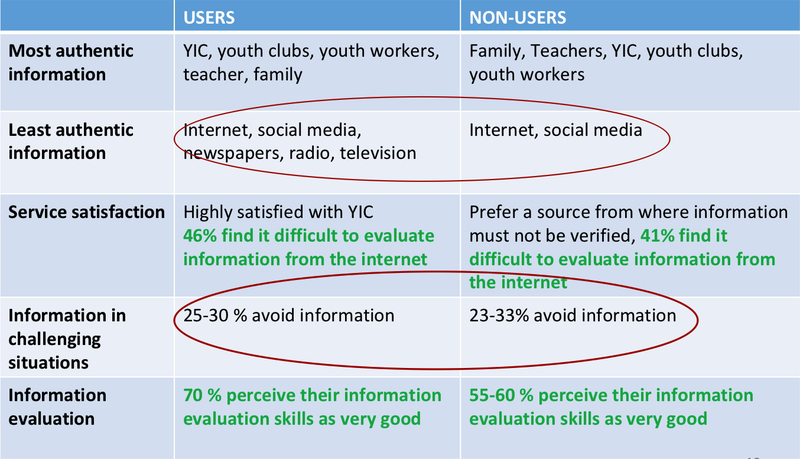 We need to understand youth information behavior even better to be able to support their information mastering skills. Focus on media and information literacy important. The role of counseling will be important in the future. Youth Information Centres need to explore and apply innovative ways to inform and build young people’s autonomy and resilience. developing youth information service strategies. Finally, Gunilla reminded us that not everyone is part of the digital society (Figure 5) but, according to Benjamin Disraeli, As a general rule, the most successful man in life is the man who has the best information. This entry was posted in democracy, other computing, other research, study by Bruce Ryan. Bookmark the permalink.